The Dri-Aid Tub absorbs moisture from your hearing aid. Works with any hearing aid. Does not include Capsules. The Dri-Aid tub absorbs moisture from your hearing aid, prolonging its lifetime and increasing its sound quality. Suitable for all types of hearing aid. Re-fill capsules are available see below (not supplied with this product). Capsules are re-usable. One capsule is sufficient for one cycle. They usually have a life-span of anywhere between 3-4 weeks - it varies depending on each user. They will perform effectively until the golden yellow crystals have turned into a white colour. Once they have depleted new discs will need to be purchased. 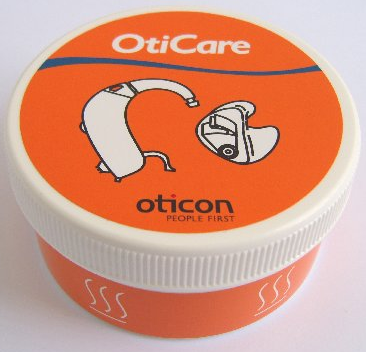 To preserve the life of the discs, it is essential that when the hearing aids or accessories are removed you should seal the oticare dry tub tight, as they will start absorbing air around them if it is left exposed. This is how they maintain themselves.